The gorgeous beaches of Cayo Santa Maria cover almost the entire length of the northern coastline of the island. They are divided in nine sections for a total lenght of approximately 13 km (8 mi) of sand. They are from West to East: Playa Matamoros (300 m), Playa Madruguilla (200 m), Playa Canon (2.8 km), Playa La Estrella (3.5 km), Playa Las Caletas (1 km), Playa La Colorada (1.9 km), Playa Perla Blanca (550 m), Playa Los Delfines (1.4 km) and Playa Las Gaviotas (800 m). 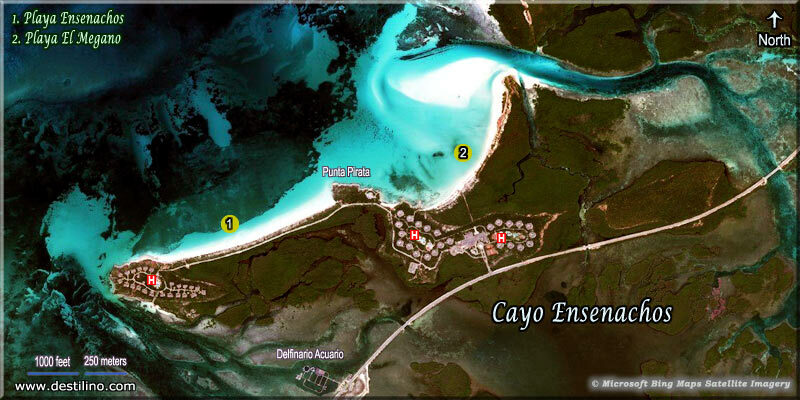 The two other nearby cayos also boast some stunning beaches, such as Playa La Salina (2.4 km) and Playa La Manteca (400 m) on Cayo Las Brujas, and Playa Ensenachos (1.3 km) and Playa El Megano (1.0 km) on Cayo Ensenachos. The east end of Playa Canon is where you'll find the Clothing Optional beach. Guests staying at hotel Sol Cayo Santa Maria have direct access to the CO beach, with is located on the west side of the hotel, wich palapas and lounge chairs. The CO beach extends westward for about 2 km of virgin beaches up to Hotel Melia Buenavista. Click to know more about Clothing Optional beaches in Cuba. The entire archipelago is part of the UNESCO recognized "Reserva de Biosfera Buenavista"; and the section of beach located at the eastern tip of Cayo Santa Maria, Playa Las Gaviotas, is part of a protected wildlife refuge where no hotel will be built. On this virgin beach the government built several sun shelters available to everyone (tourists and locals). First word that comes to mind to describe them: STUNNING! They're made of very fine white sand, with crystal-clear turquoise waters. Some stretches of beach are separated from each other by short rocky sections (emerged coral reefs). We recommend wearing shoes when crossing these natural obstacles to access the next section of sand. The entrance into the water is not too steep nor too gentle, so no need to walk hundreds of feet before having water at shoulders level. Along the west and central part of the island (Playa Canon, La Estrella and Las Caletas), the sea could be somewhat rough and choppy, so it's not unusual to see yellow or red flags in these sectors, especially on windy days, but there's almost no undertow. The sea is usually calmer along the eastern coast (Playa La Colorada, Perla Blanca, Los Delfines, Las Gaviotas). But people who are looking for a very calm sea should then consider maybe going to other cayos of the Jardines del Rey archipelago, such as Cayo Ensenachos, Cayo Las Brujas, Cayo Guillermo, or Cayo Coco. All beaches are public, but lounge chairs and palapas can be used by the hotel guests only. The beaches are mostly facing north; it means that if you sit on the beach facing the sea, the sun is behind you. The longest walkable stretch of beach without any obstacle is from hotel Melia Buenavista up to the Memories Paraiso Beach Resort. But the sand is finer and more compact between hotels Melia Cayo Santa Maria and Memories Paraiso Beach Resort so your feet don't sink as much as when walking between hotel Melia Buenavista and Sol Cayo Santa Maria. Don't forget to bring a good supply of water, a hat, and sunscreen for a long walk under the sun! Strong surf makes shore snorkeling a little difficult in many areas along the coast of Cayo Santa Maria, and the entrance into the water is mostly sandy. But there are still a few rocky areas and some coral heads that are reachable from shore. Visit our Snorkeling section for more information about the best snokeling spots in the Cayos of Villa Clara. The hotels are all oceanfront but have been built a little back behind the dunes; the beaches are accessible via several raised footbridge for a minimum impact on the dunes' flora and fauna. Some of them can be as high as 2 meters (like in hotel Starfish Cayo Santa Maria). The dunes also serve as a natural protection against tropical storms and hurricanes, thus minimizing damages to hotels. Note that the section of Playa La Estrella located in front of hotel Playa Cayo Santa Maria is more narrow, so in this case they install the palapas, shelters and beach chairs on top of the sand dune. Important! You should never wear jewelry when swimming or snorkeling, shiny objects can be mistaken for a small fish and attract the attention of barracudas.